There used to be a pan of this Raspberry Cream Cheese Coffee Cake in my kitchen yesterday. There also used to be crumbs in the pan, but then I picked out every last little delicious morsel before washing the pan. That’s a lie. I haven’t washed the pan yet. But I can’t bring myself to wash out the memories of what was once my only food for a whole weekend. I mean, really. Do you really need anything else in the world? If you like cake for breakfast, this is for you. And if you’re open to the idea of cheesecake for breakfast, this has your name written all over it. If you’ve ever taken one breath in this life, this is going to be your favorite coffee cake ever. Let’s start at the bottom. Classic buttery coffee cake holds it all together. Smooth cream cheese is baked right on top, sweet raspberries are poured all over, and the whole thing is sprinkled with more buttery crumbles. Ohhh. Yesss. This is Breakfast with a capital B. 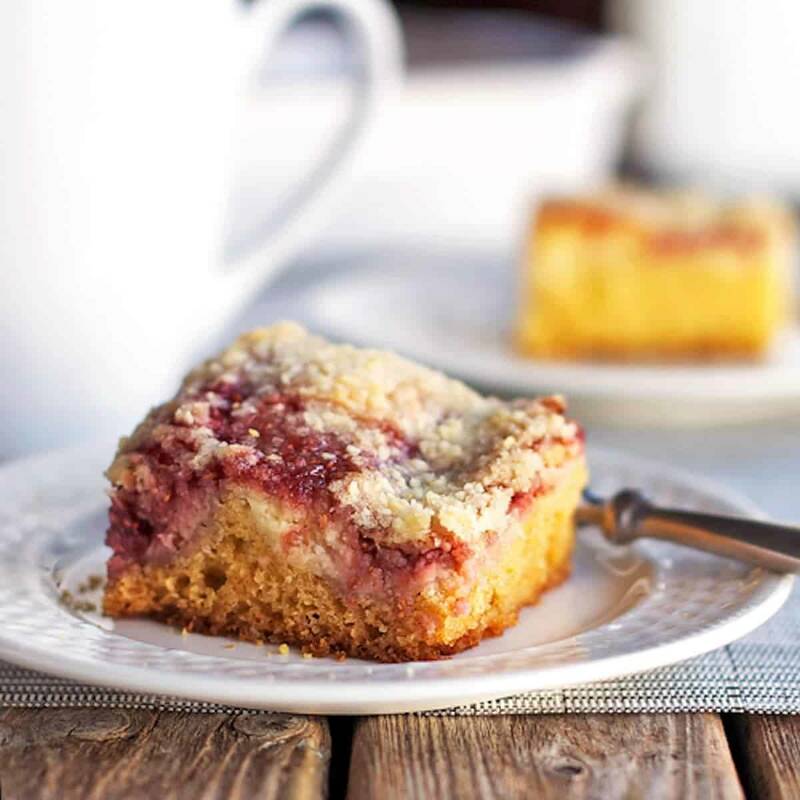 This raspberry cream cheese coffee cake is a delicious way to sneak a little fruit into everyone’s favorite brunch. SO easy to make! Preheat the oven to 350 degrees. Mix flour, sugar, and butter with a pastry cutter or in a food processor to make a crumbly mixture. Reserve 1 cup of the crumbs for topping. Combine remaining crumbs with baking powder, baking soda, salt, sour cream, and 1 egg. Mix until mostly smooth. Spread in the bottom of a lightly greased 9×13 baking pan. Beat softened cream cheese, 1/4 cup sugar and 1 egg until smooth. Pour over the batter in the pan and spread in an even layer. Spoon the jam over the cream cheese layer and swirl with a knife to make a marbled effect. Sprinkle reserved crumbs on top. Bake for 45-55 minutes until a knife inserted comes out clean. If your raspberry jam is too thick to spread, thin it out with a few tablespoons of water until it’s easily spreadable. I loved this cake fresh out of the oven but even more after it’s cooled down for a little bit. I dare youuuu. As if you need to be dared. I have been dreaming of a recipe to feature my strawberry jam. If my brain-child doesn’t work, this will. be. happening. . . . tomorrow! PS – you’ve been a posting maniac over the last two days! Maybe they’ll serve this on the plane? 🙂 Have a good trip! gorgeous looking cake!! this has the best combination of flavors and it would be an awesome breakfast item to look forward to with a cup of joe! *sigh* this is my favorite and would go perfectly with my coffee this morning! If only I could do that every day. I don’t even like cream cheese and you’re making me want this! This is all I need in my life right now. Allllll I need. There’s a reason breakfast is my favorite meal of the day–and I am now craving coffee cake. This looks ridiculous…I don’t know what occasion to make it for but I’m going to find one! oh yum! This looks like my kind of coffee cake! This looks dangerous…in the best way possible. I’m eating a carrot wishing it were raspberry cream cheese coffee cake. HA! That’s hilarious. And why are you eating a plain carrot? Bleh. This looks amazing!!! I love homemade coffee cake. I grew up eating coffee cake and this is such a great looking one…and with cream cheese. Those are the best! And raspberry jam…yuuuummmmm! Coffee Cake is such a weird thing… it’s basically saying it’s acceptable to eat cake for breakfast. But I’m very ok with that. Love that beautiful red swirl! Can I have this for breakfast every day?! I didn’t use to crave treats for breakfast, but lately I’ve felt like thats ALL I want for breakfast. I try to rationalize with myself and say that coffee cake and breads with sugar are better than donuts. This though would take the cake as the most amazing breakfast, guilt or not. Top this off with coffee and it’d be wonderful. Looks tasty! I love strawberry crumb bars so I will have to try these too. Strawberry crumb bars? Hi yummy! That sounds awesome! I saw this on tastespotting this am and since I’m indulging my inner fat girl for the last 2 weeks of my pregnancy I knew I was making this… today… I just put it in the oven and my house smells AMAZING right now! Thanks for a great recipe! Congrats on your soon-to-be-delivered baby! 🙂 Glad to hear you’re feeding him/her well. This looks great, and I already have everything I need to make it! The raspberry swirls in the coffee cake batter made me wish I didn’t swear off desserts for a month (no seriously, I did..why would someone do that?). Great recipe, and I’ll be sure to make this when I get back on the desserts train.